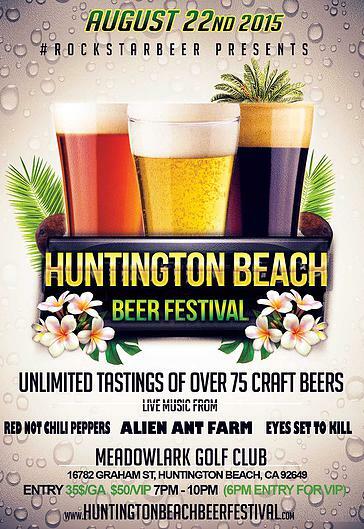 So, the Huntington Beach Beer Festival was this past weekend. Mike and I attended, along with a few others, mostly because we got in for free... We went to the Newport Beach Beer Festival back in April and had a weren't impressed. There were some good craft beers, but the weather was horrible, the event was over sold for the space, and to top it off our whole group got taken out by a flying 10x10 ez-up tent. Hence, free entrance into the next event. So, this time around the event was held in a bigger, open venue at the Meadowlark Golf Club. The event was well organized, seemed to be better planned and / or much less people attended, I'm not totally sure which. But we went (thank you Rock Star Beer for offering free entrance from the bad experience last time) and had a good time. There were a lot of great craft breweries with samples to try. We tried a lot of beer, had fun, and enjoyed the event. Overall, we had a much better experience at the Huntington Beach event and would recommend any beer lovers to attend - as long as the event is more like this past weekend!